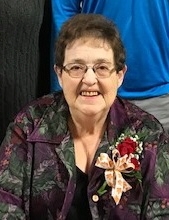 Thelma Lydia Fuenger, 81, of Cashton, WI, passed away Monday, April 8, 2019, at Vernon Manor in Viroqua, WI. Thelma was born October 27, 1937, to Frank and Joy (Mossholder) Conrad. June of 1957, she was united in Holy Matrimony to Joseph Fuenger. Thelma had a huge heart, a wonderful sense of humor and could always be counted on for a first-class knee slapper. Her home was always a welcome place for her family and friends to visit her; and Thelma’s door was always open to those in need. Thelma is survived by her children, Paul (Shelby) Fuenger of Genoa, WI, Karen (Jack) Leis of Cashton, Marlene Gallup of Stoddard, WI, Rosemary (Roger) Peaslee of La Crosse, and Mary Jo Kast of Cashton, WI; 22 grandchildren; many great grandchildren; along with many nieces, nephews, other relatives and friends. Thelma was preceded in death by her husband Joseph; children, Peter Fuenger, Phil Fuenger, and Carol (Ron) Marx; brother, Junior “Frank” Conrad; sisters, Ann Dickman and Vicki Griffin; and a son-in-law, Ron Call. A Mass of Christian burial will be Thursday, April 11, 2019, 10:30 a.m. at Sacred Heart Catholic Church in Cashton, WI. Father Michael Klos will officiate. Burial will take place at a later date in the Nativity of the Blessed Virgin Mary Catholic Cemetery on St. Mary’s Ridge, Wisconsin. Visitation will be held Wednesday, April 10, 2019, 5-7 p.m. at Torkelson Funeral Home in Cashton, WI. Visitation will also be held on Thursday from 9:30 a.m. until the time of service at Sacred Heart Church. The Torkelson Funeral Home of Cashton, WI, is assisting the family with arrangements. Online condolences may be offered at www.torkelsonfuneralhome.com. "Email Address" would like to share the life celebration of Thelma Lydia Fuenger. Click on the "link" to go to share a favorite memory or leave a condolence message for the family.